The car lighting products & accessories below will be coming to All-Neon-Car-Lights.com real soon! So and get ready for their release, as these patented products will not last long. Our initial stock for these Brand New products is expected to last no longer then 1 month. So be quick! We have spent many hours researching the very best car lighting products out there and no product, even after months of testing came anywhere close to the quality and reliability of Plasmaglow's products. All their light accessories come with a Life Time Warranty Yep, Thats Right, Life Time!! Plasmaglow continuously produce new innovations for the car lighting industry, so as *You* can benefit from modern technology in this arena, while staying ahead of the competiton. These products are a first of their kind in the automotive lighting industry. Be one of the first to have them installed on your vehicle, make your friends look on in envy! The products listed below have been designed, manufactured, tested, and approved by PlasmaGlow, the No.1 leading car lighting manufacturer in the industry. Make sure you Book Mark This Page and come back often to see if these products have been released. When they are, you'll find them on the New Releases page. 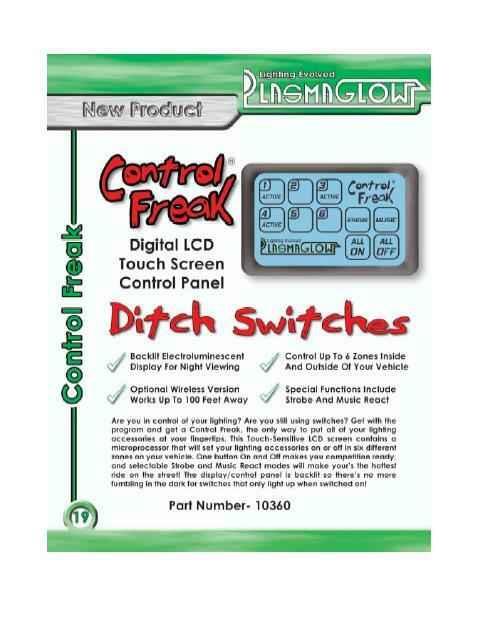 Control Freak- Digital LCD touch screen control panel. Coming Soon- Back to Home Page.